Scenario: The mysterious bandaged man tries attacks Rachel again in the middle of the night. 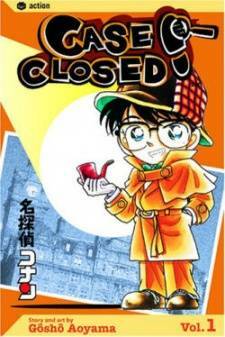 When Conan figures out the case, he tries to make Ran the detective, but knocks out Sonoko instead. 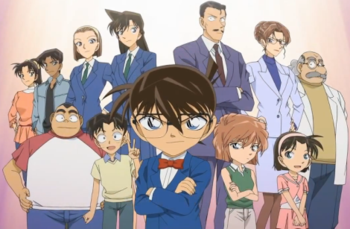 Conan reveals through Sonoko that Felix, the set designer, killed Jessica and made an attempt on Ran's life. Knowing Felix has expertise in technical production, Conan deducts he faked the kidnapping. Jessica was already dead before the kidnapping. With the problem of the murderer's weight, Conan reveals that Felix stuffed his shirt with the axe murderer's costume and at one point Jessica's head, making him appear heavier than he actually is. Felix confesses and explains that Jessica's award-winning script, The Blue Kingdom, was stolen from Emily, the sixth member of the club. Being crushed, Emily commited suicide the day after Jessica won her award, causing Felix to become enraged. Felix attempts to slit his own throat but is stopped and surrenders to the club.